Data centers are notorious power burners. 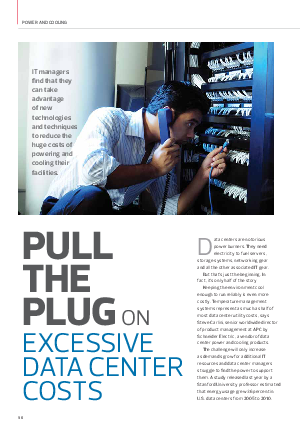 They need electricity to fuel servers, storage systems, networking gear and all the other associated IT gear. But that's just the beginning. In fact, it's only half the story - keeping the environment cool enough to run reliably is even more costly. But there's good news: New power-saving and measurement technologies, along with maturing best practices, can help IT managers implement comprehensive strategies to better rein in energy costs.